Mobile casinos are still in the lift, so it’s very important for any serious online casino to have a good mobile version. Casumo already had a nice mobile casino, but they now have made some huge updates and upgrades and improved the mobile casino enormous. When you play at Casumo you earn achievements and trophies, now all your trophies and achievements are also listed in the mobile casino. The design also had a new design and the casino is now very clear and much more easy to use. Of course they also updated their banking. Now making a deposit or withdrawing your winnings is just as easy as on the desktop version. Which of course is a huge plus. And last, you are able to personalize your dashboard, listing new games, popular games and also your last play games for easy access. 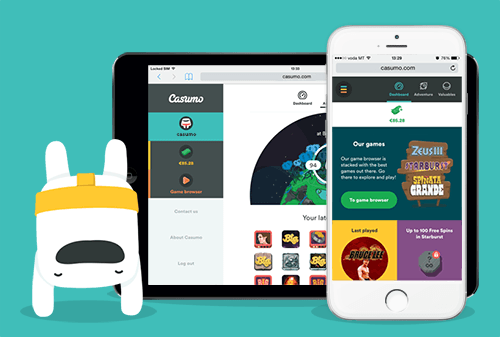 Be sure to check out the new mobile version of Casumo for yourself. Or the desktop version. I have added Casumo to the number one spot of my top 10 list recently because I think this casino deserves it. They offer amazing games from NetEnt and Thunderkick, but also all games from Williams Interactive and Novomatic. And Casumo runs a lot of very fun promotions every week and pays out winnings fast.